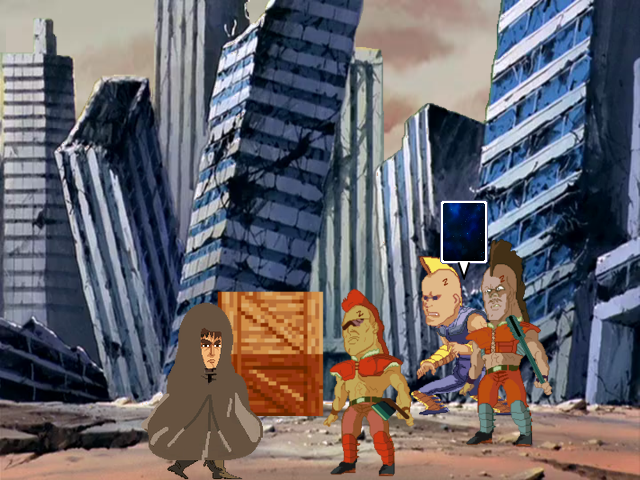 I have just released a demo of the first chapter of a fangame based on the Hokuto no Ken anime and manga. The game is a beat'em up rpg mainly programmed with a edited version of the XAS battle system. Kenshiro is the heir of Hokuto Shin Ken, a deadly martial art originated from China. His girlfriend was kidnapped and he's wandering hopelessly in the desert to find her in a post-nuclear holocaust world. The main core of the battle system is a edited (by me) XAS battle system by Moghunter. Event systems play a major role as well. Other scripts are also used. This game can be defined as a "2d version" of Ken's Rage, the Koei beat'em up. I "stole" the character's growth system idea from it as well as the Quick Time Event finisher (credits go to Moghunter again for the chain command script). The character will be able to purchase skills through the Meridian Chart by obtaining ability points after defeating enemies. The character will be able to equip 3 different battle skills (basic skills, counters and special skills) as well as 1 support skill (to boost the character's stats). You might need the Rpg Maker XP RTP as I am afraid there is a couple of things that are default. Please give me your feedback, especially for what concerns the boss battle. this looks really nice, i know that you will make a few people very happy with this. talk about throwing a bucket of gasoline on a fire of inspiration! I've always been a Fist of the North Star fanatic and it always kills me on how naive I was for lending out my comic book collection back in the day. @blue - so far only 3 people replied ~ I'm certain there will be more. True that, and im informing a few friends of this. they'll be sure to enjoy it as well. I'm sorry I didn't post much information on this project of mine, I promise I'll add more asap. @gameface101: I'm glad you're a Fist of the North Star fan! Here in Italy my generation grew up watching that. I noticed that some of you guys seem pretty skilled when it comes to scripting and eventing, so I hope you don't mind if I ask you a question regarding a feature I would like to implement in the tactical battle system I'm using (Gubid) which allows for the placement of extra party members and troops on the battlefield. While these extra troop members are able to move/attack/die like their counterparts, I can't use conditional switches to call events when they are hit, have a state inflicted, etc. because the drop down menu only lists 8 enemies. Example: If enemy#8 has state "Hit" inflicted==>show picture 3. Do you guys think it's impossible to do so through events? I'm having doubts on which battle system I should use the most and I need your advice. At first I wanted to use a sideview bs as the main one, using xas only on certain occasions (for instance in some boss battles that need lots of dynamic effects or require the player to change it's graphics) but recently I thought I could use xas all game long thanks to the countless opportunies it offers through eventing and thanks to hackel's ally system. What do you guys think? What would you do you you could use 3 different battle systems (real time, tactical, sideview) in such a game? Yo shogun3 - just curious, what did you end up using? I know it's been over a year but I haven't forgotten about this and still look forward to the Fist's RPG. just sent you a PM with an early version of the latest Xplat project yet to come. Maybe this could be used as your starter kit? edit: yo sho, did you get a chance to look at the project I sent you? first post updated! DEMO AVAILABLE! shogun3 wrote: I noticed that some of you guys seem pretty skilled when it comes to scripting and eventing, so I hope you don't mind if I ask you a question regarding a feature I would like to implement in the tactical battle system I'm using (Gubid) which allows for the placement of extra party members and troops on the battlefield. Well not that i don't support XAS or anything seeing as its a great ABS. But WABS has what you want basically build into it, granted it's not complete yet still in alpha. The AI team mates are event clones and have their own built in HUDS. < Looking like an aid for you. Granted XAS can do it too but not with out some additional programing and eventing. Granted that wont be an option seeing all the work you have already put into the project. # Create an event with a comment in an event in the TOP 10 LINES! # i.e. "BIGEVENT 2 2" will make an event 2 tiles by 2 tiles large. if temp and !event.jumping? and event.over_trigger? if temp and !event.jumping? and !event.over_trigger? do you have an icon/logo for this project? or would you like me to make one for you? Thank you so much Gameface, I do not have an icon, feel free to make one if you wish, I am sure I would love it Lemmie know what you think of the enemies etc, I only have a couple of problems so far in setting them up with the side movement scripts: the one you created is nice but unfortunately it makes the character move while executing a skill. ...man I should have done this from the start :~. awesome mini-boss and car racing!? Awe yea... gonna be checking this out in a bit. mr_wiggles wrote: Awe yea... gonna be checking this out in a bit. Very cool game concept, like that ya got some kinda movie element to some of the story aspects. You do need RMXP in order to play this, I did not but had RGGS_standard.dll and patched it to work. However I could not read any text.